The making of the tombstone survey - on this site. William Aldridge Cockey of Ashburton, son of Peter, matriculated from Queen's College, Oxford, on the 10th June 1780, aged 18. 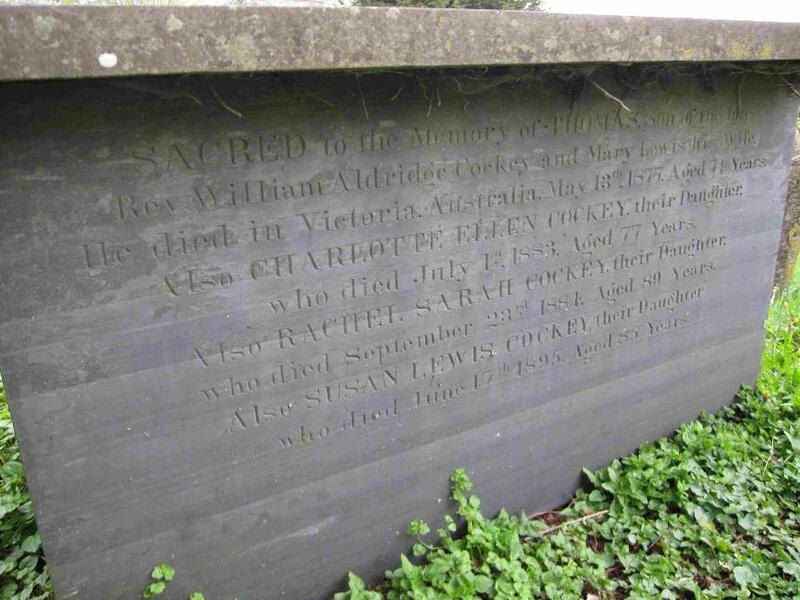 Described as the Clerk of the parish of Rattery, William married Mary Lewis Hodge at Buckfastleigh on the 21st December 1789, and they have a daughter, Mary born in February and baptized in Buckfastleigh in March 1790. From 1793 onwards the couple have nine children baptized at Ashburton: William (1793), Rachel Sarah (1795), Robert (1797), Elizabeth (1798), Frances (1801), Thomas (1803), Charlotte Ellen (1805), Anna (1807), Susan Lewis (1809), and William Aldridge (1812). January 1804. Mrs Elizabeth Cockey, described as the mother of the Rev. Wm A. Cockey, was buried in Ashburton. William Aldridge Snr. died on January 18th 1816. By this time he was the rector of the parish of St. Stephen in Exeter. ** The Minden, launched in 1810, was a third rate Ganges class 74 gun ship. Above: HMS Tremendous (foreground) and HMS Hindostan, both ships of the Ganges class. In 1829 Brooking Soady, of Hendon, Middlesex, married Mary Cockey at Ashburton. She was, according to an announcement in the Exeter Flying Post, the eldest daughter of the late Rev. W. A. Cockey. Headline in the Western Times 3 August 1839 p4 col3ff. One of the cases heard at the Nisi Prius Court of the Devon Lammas Assizes in 1839 was that of Cockey v. Smith. Anna Cockey, the daughter of a clergyman, was living in Ashburton with three unmarried sisters circa 1835/1836, when she was introduced to Mr. John P. Smith, the son of a Devonport solicitor, who was in the area in connection with the management of Lord Clinton's estate. They became engaged in July 1836. By February 1838 one of Anna's sisters, Charlotte, asked Mr. Smith if his affections were still the same, and he assured her that they were. About this time, it was alleged, he 'took advantage of the confidence' of Miss Cockey, and 'obtained that which involved her in ruin'. About ten days later he left the town and from then on visited her infrequently, until eventually he failed to visit her at all, even when he had business in the town. Miss Cockey was pregnant, although no-one, not even her family, knew this until the day the child was born*. When presented with this fact by Mr. Soady, Anna's brother-in-law, Mr. Smith wrote a letter stating his intention to marry Miss Cockey as soon as she was well. Later, however, he wrote again, claiming that he was overwhelmed by the news of the birth of a child. On reflection, he said that he did not believe they had connected in such a way as to produce a child, and that the baby was not his. The following March Anna wrote to John, asking him to fulfil his promise to marry her. He did not honour that promise. The court was packed to hear the case, which went on until 11 o'clock. The jury found for Miss Cockey, and awarded, to cheers, damages of one thousand pounds. *The birth of John Smith Cockey was registered in Newton Abbot in the December quarter of 1838. I have found no further reference to him. John Pridham Smith had become an articled clerk to his father in November 1827 at Devonport. Ancestry.com. UK, Articles of Clerkship, 1756-1874 [database on-line]. References to a John Pridham Smith in Australia suggest that he may have moved there by 1840. 1840. William Cockey, solicitor, is the Ashburton agent for the City of London Annuity and Loan company. In 1852 W. A. Cockey, deputy coroner, is offering himself as a candidate for the post of coroner for the Totnes District. When he was elected later in the month the bells of St. Andrew's rang out, and the band played throughout the town. In the 1861 census William A. Cockey is living in East Street in the house of his sister Rachel S., together with three other sisters, one of whom is Charlotte E.
William is the coroner in 1861. All the siblings are unmarried. Anna Cockey, father William Aldridge Cockey deceased, married George Heywood on 26th October 1868, at St. Clement's Church, Notting Hill, borough of Kensington and Chelsea (parish register). In the 1871 census they are living in Fulham - she is 53, and George is 72.